Boggit returns to the "old days" when Rome ruled the world, and argued over it incessantly. Alea Jacta Est is the latest addition to the well regarded series of strategic/operational wargames produced by the Indie developer AGEOD. 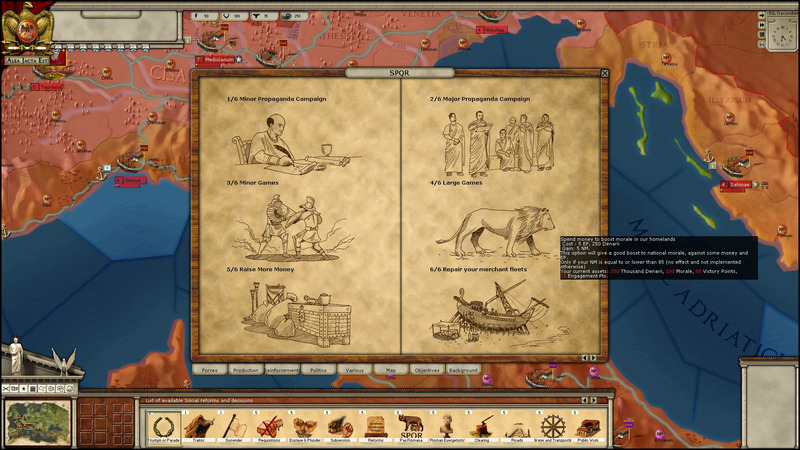 Alea Jacta Est is concerned with the wars of Ancient Rome with a particular focus on Roman Civil Wars, although it is possible to assume a non-Roman role in some of the scenarios. For those who have played previous AGEOD releases, like Wars in America, Rise of Prussia, or Revolution Under Siege Alea Jacta Est will seem quite familiar at first sight. To some extent this is a superficial familiarity since the game engine has been tweaked for Ancient warfare rather than one where firepower is a critical factor, resulting in subtly different gameplay. For example, cavalry charges take on a new importance and are potentially deadly, depending on the terrain being fought over. There are also new siege rules reflecting the realities of Roman Legionary siege techniques and so on. If you are new to AGEOD’s wargame titles the gameplay is quite unlike many wargaming titles where players tend to have considerable control over their pixel armies. Here you are in the world of the Commander in Chief - you can give your armies rules of engagement, set their aggression level (or combat stance) and order them to a location. There to do battle – or not! Commanders do not always follow orders to the letter, but can place their own interpretation on them based on their characteristics. This can result, for example, in a defensive or passive posture when you’ve instructed an aggressive stance. It can also result in generals delaying in implementing their orders. The classic example is Napoleon’s general Grouchy failing to pursue Bluecher – the aggressive/assault posture being modified to defend! It is a beautiful feature for a game at this level and particularly reflects the command and control difficulties of the pre-radio age. 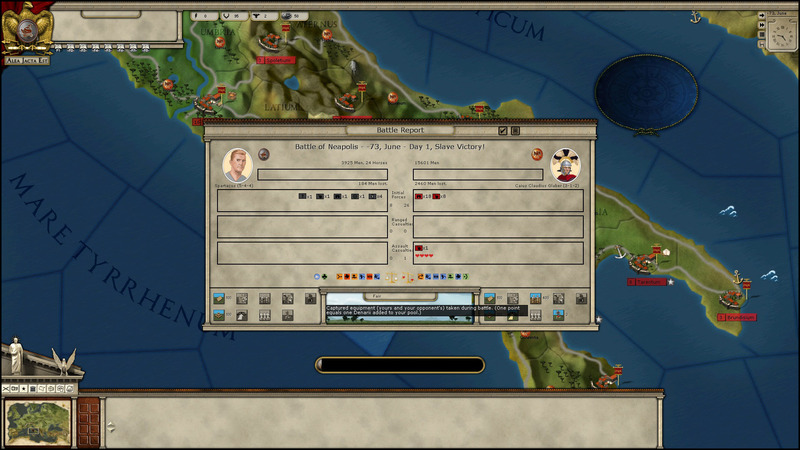 Commanders can have a wide variety of traits, each of which can influence either their direct behaviour or the way they affect the political situation, for example Julius Caesar has as one of his traits “Fast mover” which gives a 15% stack move bonus, another trait is “Propagandist”, which gives a boost to loyalty in a region where he is present. Oh, happy day! Well not for the Senate anyway! Alea Jacta Est features lots of ancient “events”. Similar to the way commanders execute their orders, combat is also resolved without direct intervention by the player – armies need to be in close proximity (normally the same region), detect each other and be willing to fight, (i.e. at least one party having either an aggressive or assault posture). Combat is then resolved in a series of rounds until one side has had enough and either disengages or is destroyed. Propensity for disengagement is one of the few things a player can influence by setting a posture like “all-out attack” or “probe” – a bit – since a commander can “interpret” this too. Pursuit is possible, and as with many actual ancient battles can cause more damage in the rout than the battle itself. This is an instance where less really is more, since it forces the player to consider the quality of the commanders employed against the quality of the opposition they are up against. This is not to say that combat resolution is arbitrary. Yes! I’m Spartacus – and don’t you forget it! Note the potential for battlefield loot and prisoners. The Detailed Combat screen. AGEOD are being gentle on players as to how the game engine gets here though. I’d swear Spartacus looks like Kirk Douglas – LOL! When forces do collide in combat, this results in a summary battle report. Further details can be seen by clicking on a button to go to a unit by unit report. Results show casualties, leader casualties, but also neat features like prisoners taken and battlefield loot, which convert to denarii – the sinews of war! The portrayal of results by report can be a good thing, since it does not slow the player down with all the minutiae of the battle every time there is a fight. However, it may give the impression that combat is simple and fairly arbitrary. It really is not. The game hides a whole slew of interrelating factors being considered under the bonnet of the combat engine. This includes factors like, terrain, army frontage, cohesion, raw melee factors, as well as the less obvious initiative, cohesion and morale checks etc. The list of factors is really comprehensive. Unfortunately it is out of the scope of this review to give much more than an indication of the unseen depth to the game. I have only ever seen this approach taken in a few other games like “1848” by Hussar Games and “American Civil War” (by Frank Hunter’s Adanac Studios) although in those cases not to the same degree. Unraveling the arcane. 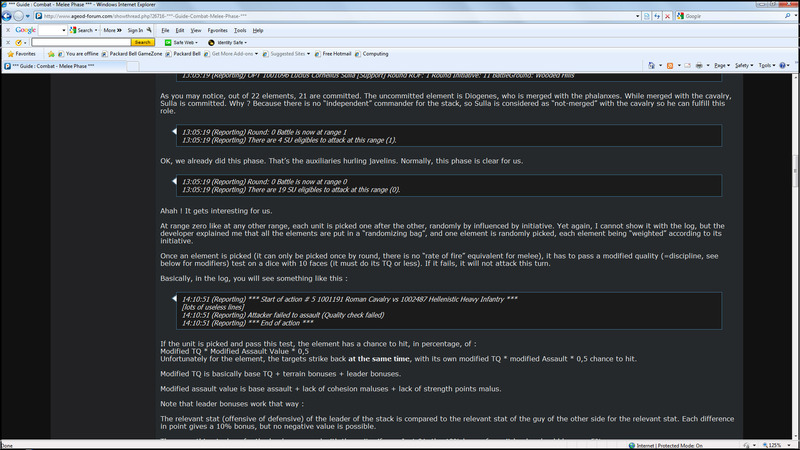 Narwhal explains the intricacies of combat on AGEOD’s Alea Jacta Est forum. For players interested in the factors and algorithms going on I heartily recommend Narwhal’s series of sticky posts on the AGEOD Alea Jacta Est forum where it is explained in comprehensive detail. Whilst, I’m on the subject of the AGEOD Alea Jacta Est forum, I’d recommend visiting it. In addition to AGEOD’s enthusiastic fanbase, it is inhabited both by the developers and the Beta testers whose informed posts add a huge amount to the understanding of the intricacies of the game, which are well beyond the scope of a review. Alea Jacta Est is played in monthly turns. Moves are plotted as described earlier and hopefully your pixel commanders will then carry out your will (well mostly). Once the next turn button is pressed the turn executes on a daily basis with movement progression and combat occurring until the thirty day limit is reached. The game is not just a wargame in the strict sense. Alea Jacta Est is multi-dimensional. There are political considerations, a wide variety of province decisions, production orders, not just for new units but also recruitment of replacements for existing formations. Money, engagement points (a sort of political capital), and national morale all have a currency value in the cost of the wide range of political, military, and economic decisions available. I like Games. In this case the bigger the better! Check out some of the provincial decisions available underneath the politics screen. Logistics are vital to winning at Alea Jacta Est and failing to account for it results in attrition. 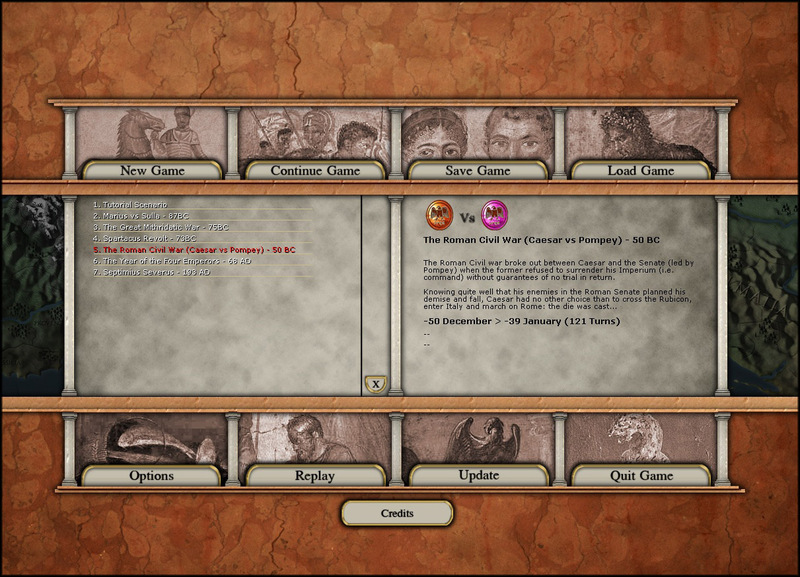 As with other features of Alea Jacta Est, the complexities of supply and attrition are dealt with in the black box of the game engine and the effects on units are reported to the player rather than involve the player in the mechanics of it. Attrition – both historically and often a bigger force destroyer than engagement in battle - is affected again by a number of factors, including disease, march exhaustion, desertion, and the availability of food supplies. Attrition and deciding how to minimise it are key issues for Alea Jacta Est generals. Attrition can be tweaked in the options menu and for the ultra-Grognards amongst us, includes a “hardened” attrition (realistic) mode. As mentioned earlier, an army can be increased by producing new units, all of which take some time to train up. However, production is not the only way to get troops. 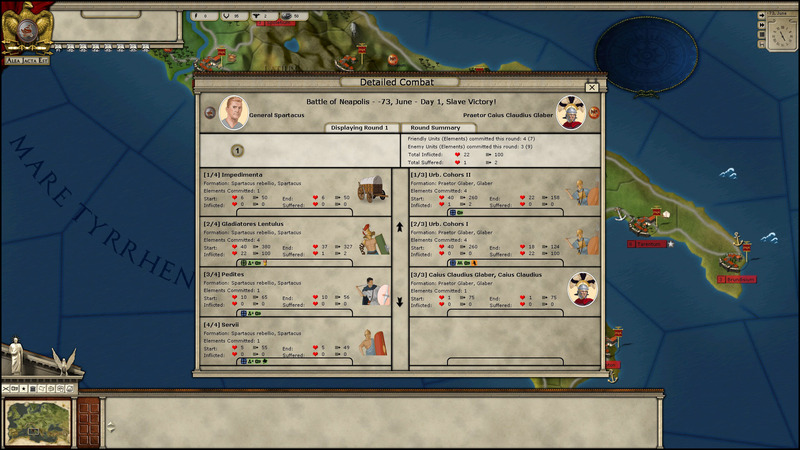 If you have the cash, then the “Imperator” screen (military options) can give you access to mercenary units or new generals. Marcus Tullius Cicero is reputed to have said "Nervos belli, pecuniam infinitam" (the sinews of war are infinite money) and it is the same in Alea Jacta Est. Troops have to be raised and paid – as if supply and attrition considerations themselves were not enough! Taxation is normally raised annually, but a lot can happen in a year. There are still a few ways to ease the treasury’s woes. One way is to lean on a loyal population. Loyalty to a faction plays an important part. Amongst a number of effects, loyalty affects production values to some extent, and another plus is that a loyal population may resist opposing occupiers. However, from the Treasury’s point of view loyalty to a faction may permit the local population to tolerate “war taxes”, at the cost of some loyalty. There is a limit to this as loyalty sinks when the local people find having something to eat, and having a few possessions are personally more important than the ambitions of a wannabe Emperor – “Nemo dat non quod habet” Latin maxim (you cannot give what you haven’t got) . At this point, if your Imperator is really feeling the pinch he can plunder and enslave in the province, which adds to the treasury, but risks pushing a province to open revolt or to subversion from another faction. 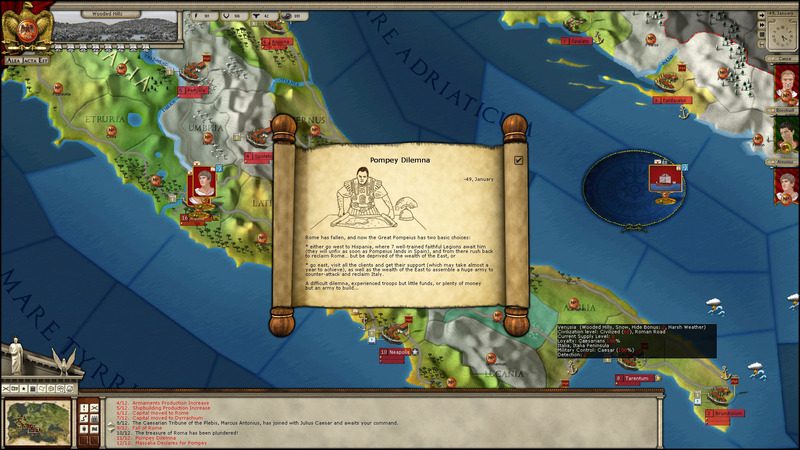 The game map is perhaps not as “pretty” as that for the comparable Europa Universalis: Rome, but as with AGEOD’s other games, the map is still very attractive and uncluttered. Province terrain and weather effects are clearly represented, whether it is a sea zone suffering stormy weather, or a mountainous region covered with snow. Decisions available to the player can change the nature of the map, since roads can be built and land clearances can be done to improve the economic value of a region. Navigating around the map is very slick. By moving the mouse cursor over a region all the relevant details are displayed at a glance with a tooltip box. I used the 1.01 patch with the game and although I’d read about complaints of jerky map scrolling with the release version, this appears to have been corrected with the new patch. “Veni, Vidi, Vici!” We’re not so smug now, are we, Pompey? The variety of units reflects all the major troops of the Roman world. As well as Legionaries, Phalangites, and the usual light troops, there are special mercenary units like German Warbands and Sarmatian Cataphractii. There are also some of the more unusual troop types like chariots and elephants. The unit cards are standard AGEOD fare, being their usual attractive cameo representations of the troops together with various details about their abilities strengths, etc. Historical Latin names are used to describe units giving the game a nice period feel. Unit pictures are really nicely drawn, with Republican Legionaries being depicted in Lorica Hamata (chainmail) and long shields, early Imperial legionaries in Lorica Hamata and convex shields and middle Imperial Romans in Lorica Segmentata (Banded mail). The unit artwork really does add to the atmosphere with that attention to detail (even though strictly speaking Lorica Segmentata had largely replaced Hamata in the Legions by the time of the “Four Emperors”. Likewise, the reforms of Septimius Severus saw the end of Segmentata in favour of leather cuirasses as a more economic alternative in an expanded army when such legacy armour was not only getting worn out and harder to maintain, but expensive to produce en masse – I’m being ultra-picky here). As with commanders, units themselves can have particular traits, which affect how they do things in the game, for example, Caesarean Legionaries have the trait “Entrencher” giving them a defensive bonus and slingers and javelinmen carry the trait “skirmisher”, which impedes enemy reactions by giving an initiative bonus. The vanilla version of the game comes with six scenarios (including a tutorial) varying in length and complexity. Three are set during the Late Republic: Marius vs Sulla, The Great Mithridatic War, Caesar vs Pompey, one during the Early Imperial period: The Year of the Four Emperors and one during the Middle Imperial period: Septimius Severus. At first blush the limited number of scenarios might seem a little disappointing given the wide variety of potential conflicts that could have been included like the Punic Wars, the Pyrrhic War, the First Triumvirate (Caesar in Gaul, Crassus in Parthia and Pompey nominally in Spain), the Wars of Marcus Aurelius, Julian the Apostate, the Rise of Augustus, etc…. To be fair, AGEOD like many Indie developers runs a lean operation and plans to expand the scenario bank through a series of expansion scenarios sold as DLC for the core game as they did with their previous title set in the Industrial Age: Pride of Nations. There is a lot of demand for new scenarios on the Alea Jacta Est forum itself and the fans have proposed a lot of interesting scenarios. AGEOD have a good reputation for listening to the Fanbase and they’ve not been slow to follow up on new scenarios. 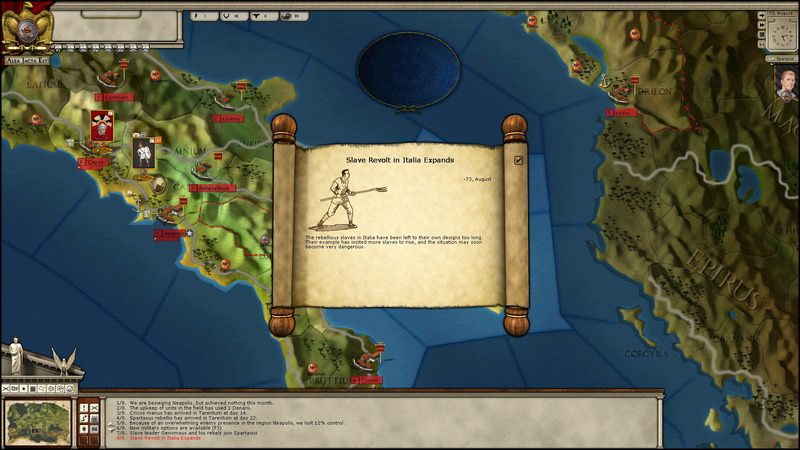 The Spartacus Revolt is currently available as the first separate DLC scenario. Although the initial offering of Alea Jacta Est may seem a little light in variety of scenarios, the scenarios themselves are fairly meaty with plenty of turns and lots going on, so when you get to grips with the game you don’t feel short changed. H’m, what to play? What about Caesar vs Pompey? – Alea Iacta Est! If you’re into the style of wargame AGEOD produce, Alea Jacta Est is an absolute delight to play. The modified game engine gives a good reflection of strategic warfare in the Roman world .The emphasis on command and control and being able to supply, pay for your troops and avoid the various sources of attrition is a real concern for budding Imperators. I’d have liked to have seen more scenarios and with a wider breadth than what are essentially Roman vs Roman conflicts. That said AGEOD are starting to crank out new scenarios to fill that gap. The game is easy to play, but to get the most from it requires study and understanding of the game concepts and algorithms. Because of the complex and wide ranging interrelationships between different factors affecting the game reading the manual is essential to understanding Alea Jacta Est. I’d further recommend reading some of the well considered and informative posts from the Alea Jacta Est forum to get the most out of this game. If you are into Ancient strategy and want something that is very accessible, easy to play and yet – ironically - has massive depth and complexity to it, then I have no hesitation in recommending this excellent game.